Sorry for being somewhat MIA. I've been having a tough time balancing life! Moving really shook things up more than I had anticipated. I can't find anything in the zillions of unpacked boxes and my head is as messy as my house right now. Blogging has been on the back burner since it's all I can do to get myself dressed in the morning and out the door to work. I haven't had a mani/pedi in a month (please don't look at my feet!) and I have bags under my eyes. Time to get back to normal (or whatever that is!). So although I don't have any new photos to share on this blog, I do want to tell you about a fabulous dress that I posted about last year because it is now under $20!!! Yes you heard that right! 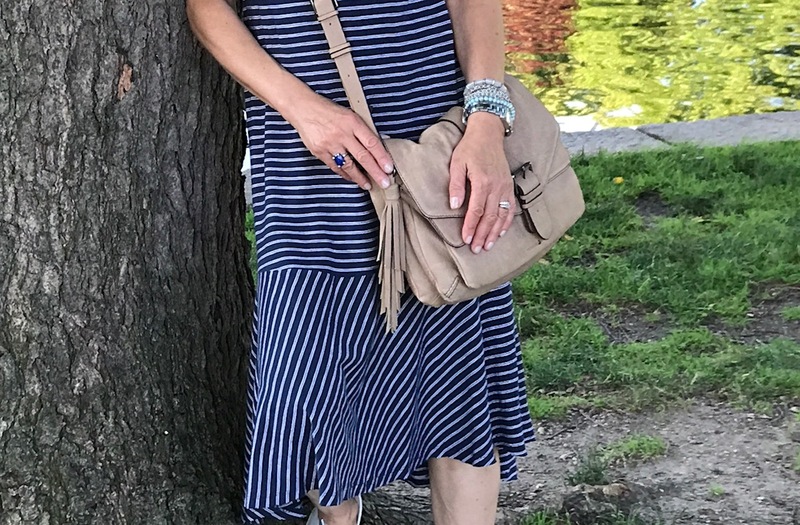 I bought this super comfy and adorable Caslon dress when it was over $40 (even that was a sale), but now it's down to $19.97 and available in several different colors including a lighter stripe. Find it here. 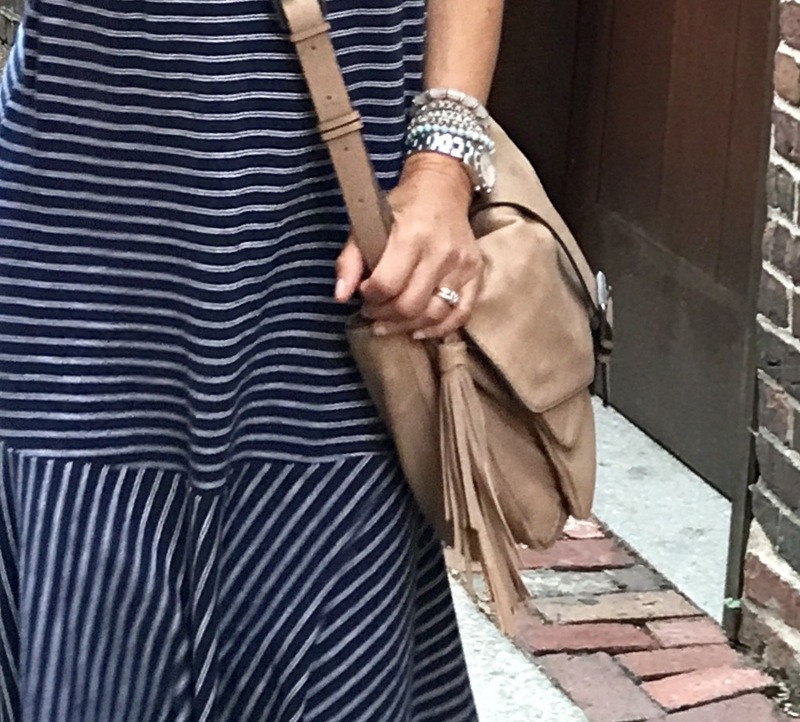 I can't say enough good things about this lightweight dress that is perfect for every day and a must-have for travel. I love the length, flow and the little flounce at the bottom. It also layers so well (I like to wear it with a jean jacket). Keeping things casual with a slouchy tassel bag (similar and in two colors here), silver watch and bracelet stack (love these and these). 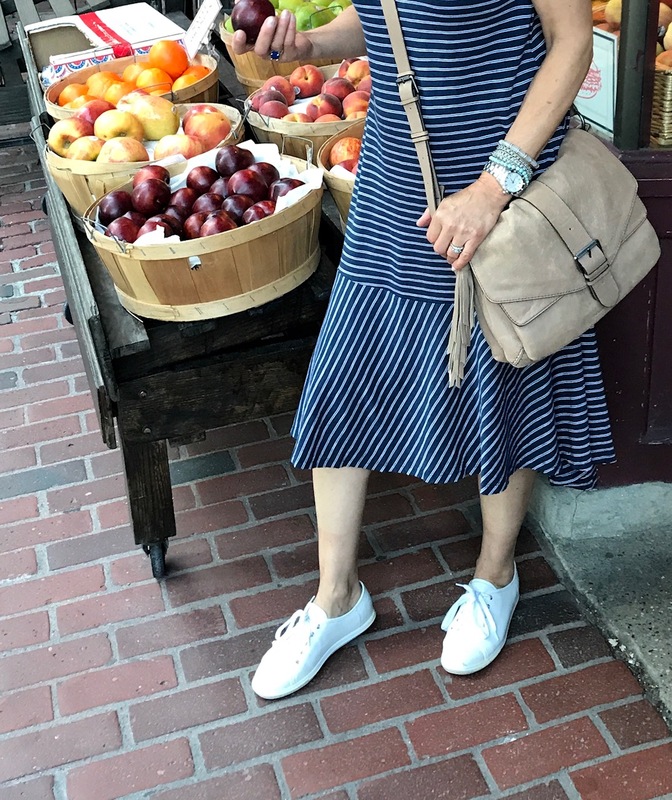 Sneakers are my new bestie--I've been living in them! When my feet are happy, I'm a happy girl. Signing off now--I'm going to order another one of these dresses even though I should be tackling more boxes! I promise to get back into the swing of things very soon. Thanks for bearing with me my friends. Some links in this post may generate a very small commissions but rest assured, I only post what I love. Take care of yourself, boxes are going nowhere. Save for lousy weather when your stuck inside (fabulous excuse for not tackling them now ;)). That dress is adorable!!! In the summer I prefer dresses to shorts at this point in life. Always looking for super casual ones that I can do EVERYTHING in. Listen, I’m almost certain I speak for all your followers when I say we would rather experience you MIA for a bit then hear you have hit the Brick Wall and are down for the count. We will wait. I personally have only been following you for less then a year, so if you feel the need to post some “re-runs” no harm in that.